You will earn 12,358 Reward Points. Earn 1 reward point for every 1 dollar spent. Tilt lock for upright pan position. Damper assist for smooth tilting action. Solid state thermostat temperature control. One piece 10 gauge type 316 Series stainless steel pan and cooking surface. 220 V, 1 phase, 50/60 Hz. One piece lift-off stainless steel cover. Single pantry faucet with 12" swing spout. Double pantry faucet with 12" swing spout. Single pantry kettle filler, 68" hose, c/w bracket. Double pantry kettle filler, 68" hose, c/w bracket. Single pantry rinse spray head, 68" hose, c/w bracket. Double pantry rinse spray head, 68" hose, c/w bracket. Rectangular gas tilting braising pan, Vulcan Model No. VGCTS16. The skillet shall be of one piece coved corner, 10 gauge type 316 Series stainless steel with a #4 exterior finish and a polished interior with coved corners for ease of cleaning. Cooking surface shall be of 3⁄4" triple-ply construction with 3⁄8" thick aluminum core ensuring even heat distribution over the entire cooking surface. Pan shall be fitted with side pivots mounted in sealed stainless steel clad consoles mounted on a 10 gauge stainless steel base with #4 finish. 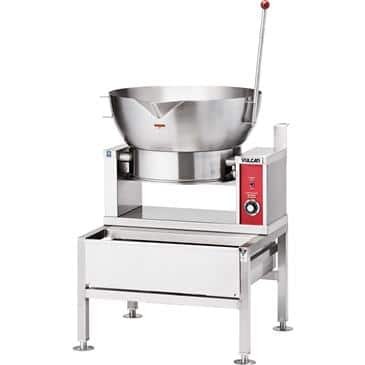 Pan shall be fitted with a stainless steel tilt handle with heat proof knob to tilt the pan forward for complete removal of contents and will include a damper control for tilt and return movements for ease of tilting. A tilt interlock shall prevent inadvertent tilting of the pan. Controls shall be integrally mounted and shall include a power switch, solid state thermostat, temperature pilot light, electronic ignition, ignition light, and a high limit temperature cut-off. Burner turns off automatically when pan is tilted. The skillet shall operate in a temperature range of 100°F to 450°F (38°C to 232°C). The skillet is mounted on a 301⁄2" (775 mm) wide stainless steel stand with sliding drain pan and stationary drain.